I had a busy couple of weeks up through the Thanksgiving weekend. I flew to Boise, Idaho, the weekend before Thanksgiving to give a deposition in a legal matter, returned, then we all drove down to Iowa to my sister's for Thanksgiving. She lives in an old (1850s) farmhouse in a valley a few miles upstream from the Mississippi River. 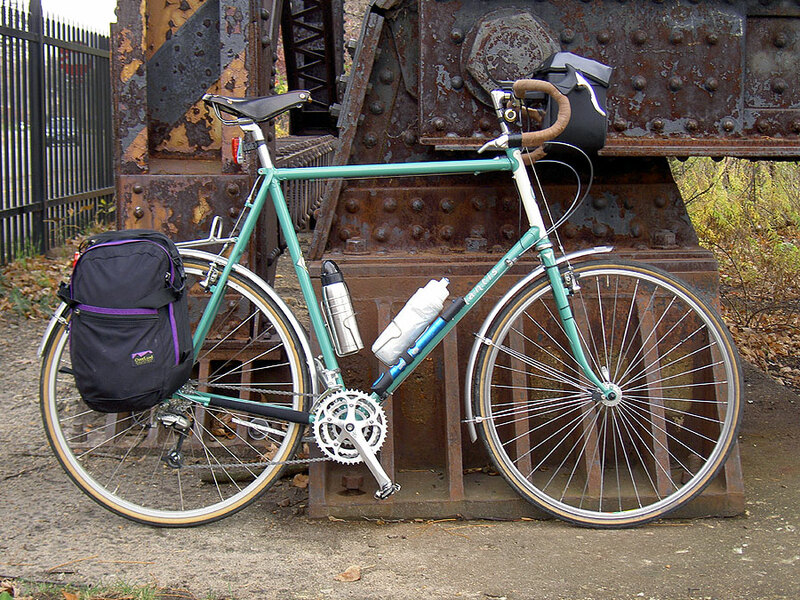 I won't go into detail on the weekend, it had virtually nothing to do with bicycles (other than admiring a Schwinn World Sport 10-speed my brother-in-law got for $17 in nice shape but with a profoundly uncomfortable seat). As much as I love cycling, as much as I love the freedom and joy I get when out riding, I also like driving. 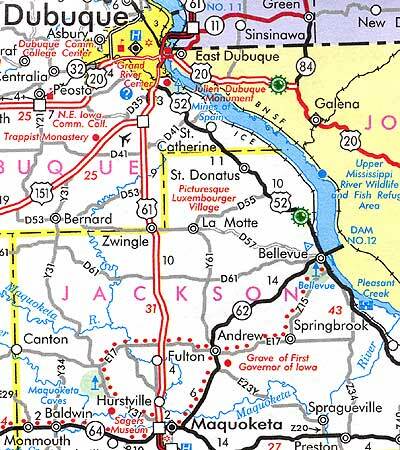 Driving to Iowa is a beautiful run, down the Mississippi along Highway 61, crossing at Lacrosse, then down Wisconsin 35. We usually stop in Lacrosse. There's a coffee and candy shop on Pearl Street where they sell candy cigarettes. I believe these are illegal in Minnesota, so we stock up. Here's Geneva looking tough putting on her Lacrosse-bowling-league-after-work-at-the-brewery face. I noticed that the candy cigarettes have become more politically correct; unlike last year, they are called Candy Sticks, not cigarettes, and no longer have a red end like a glowing cig. We always get here after Halloween, which is too bad, these would be great to give out on Halloween. I like the fallowness of the land, I like the starkness of the light, the sense of foreboding of winter. I like Thanksgiving, largely free of religious or commercial overtones, just family and friends together thankful for our many blessings. I won't go on about it. However, at one point, as we were about to set out somewhere in my sister's car, I noticed a 2005 Iowa Transportation Map for Bicyclists published by the Iowa Department of Transportation. I looked at it and asked if I could keep it. This map is pretty cool. 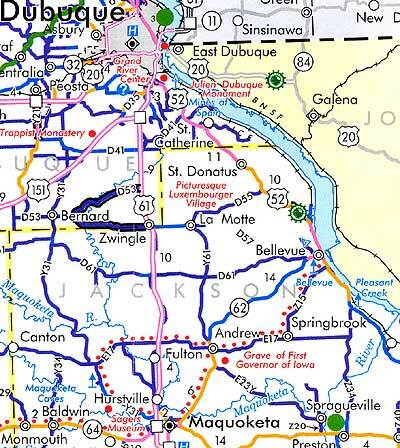 It is in essence a duplicate of the regular Iowa Department of Transportation Transportation Map but with the roads marked differently. Rather than color the roads strictly by their legal designations (Interstate, U.S. Highway, State Highway, County Road), the color is by the Annual Average Daily Traffic (AADT). The most interesting roads are the purple ones, with AADT of 0-700 vehicles. This encompasses most of the excellent and extensive County Road network that criss-crosses the state. In addition, the AADT color is black-banded when the road has a minimum 4-foot paved shoulder or bicycle lane. 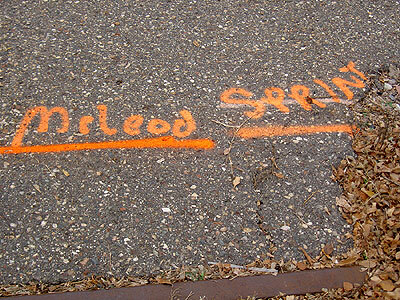 Green dots indicate bike trails under five miles in length; numbered green dots indicate trails over five miles in length, with additional information on the back of the map. Also on the back of the map are the usual city maps showing bike trails in the cities, some rules of the road, suggested trail etiquette and the clever ad, Bike Helmets: Don't hit the road without one. 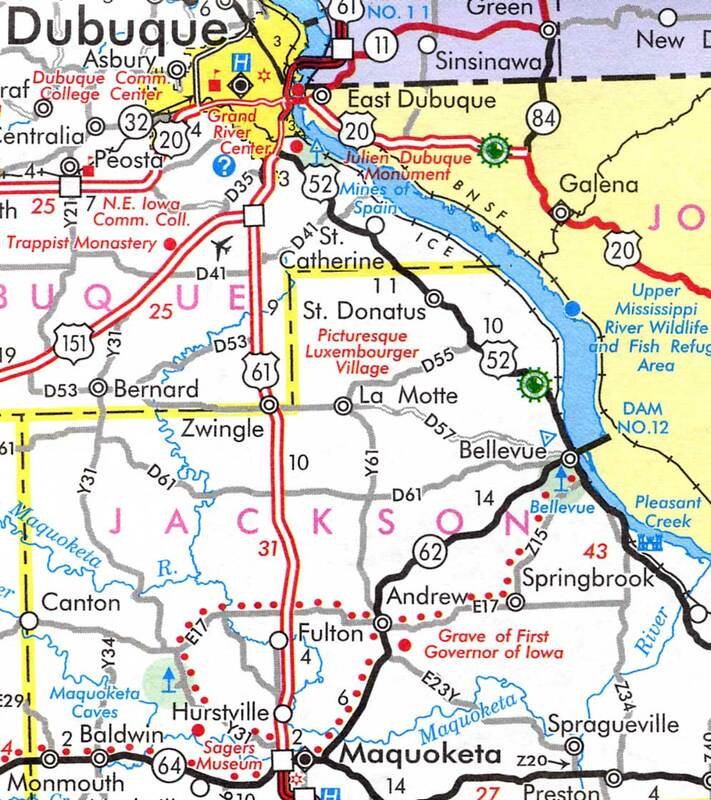 I scanned in a bit of the detail around where my sister lives from both the regular 2005 Iowa Transportation Map and the 2005 Iowa Transportation Map for Bicyclists. They show the differences pretty clearly. I noticed right away that the County Road my sister lives along is different on each map. It's between the towns of Bellevue, more or less the center of this scan, and La Motte to the west. On the regular highway map, County D57 is shown as a white-centered grey road, a gravel County road; on the Bicyclist's Map, the D57 designation is there, but the road isn't shown. This is appropriate, as the gravel road wouldn't be tons of fun to ride on. Continuing on west of La Motte to Zwingle and to Bernard, you can see that the road has the four-foot paved shoulders or bicycle lane and thus is shown in the purple (for the 0-700 vehicles a day) with the black borders (for the bike trail). Other things are also more varigated. 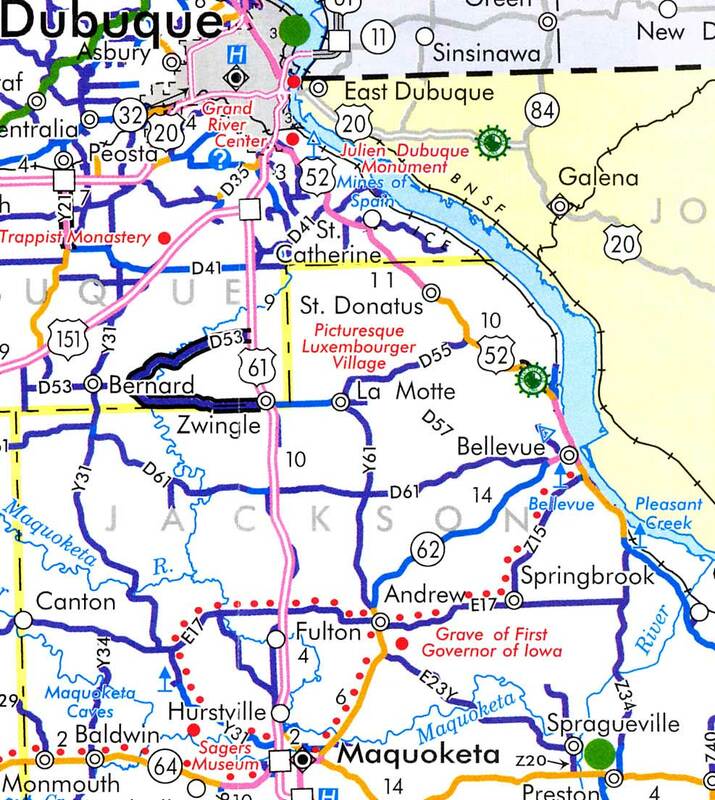 The State Highway 62 from Maquoketa through Andrew to Bellevue is a single black line on the Highway map; on the Bicyclists map, it shows an AADT of 1,501 to 3,000 from Maquoketa to Andrew and then 701 to 1,500 from Andrew to Bellevue. That gives you some useful information about the expected traffic flows. What the map doesn't show is elevation changes. I know, I know, you can hold the cracks about the boring flat terrain, try riding across this state and you will find out how wrong you are. 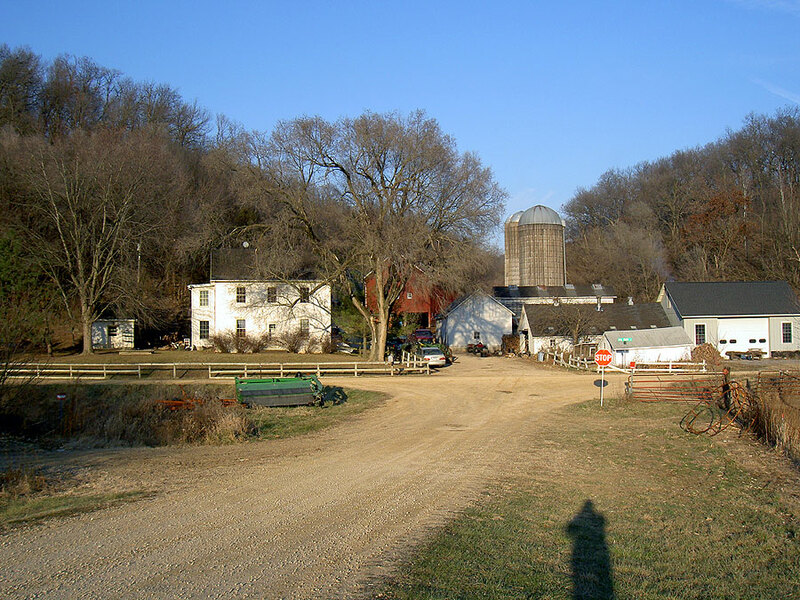 That road from Maquoketa to Andrew and Bellevue is very hilly (it's coming off the plain down to the Mississippi Valley) and you'd better be ready for some long grinds and wild descents. In general, in Iowa, if the map shows a twisty road, it's hilly (or running along a river, but you can tell that) and if it's straight, like the roads in north-central Iowa, it's flat or just gently rolling. You can infer this with experience, but it's not shown directly on the map. The photo is of my sister's farm. Jackson County D57 is crossing the photo, and is hard gravel like the road I'm on. You could ride it, I guess, but gravel roads aren't always very pleasant depending how deep and fresh the gravel is. The Map for Bicyclists is wise to leave it off as a good route. It's cool that Iowa has done this. I pretty much grew up there so have a soft spot for Iowa and Iowans who are generally overlooked and underestimated. I certainly see that here; one of my theories of populations is that every state makes fun of the state south of it. Who knows what they do in Louisiana? For all the cool cycling culture and cutting-edge attitude in the Twin Cities, Iowa has done this nifty map, hosts the cross-state RAGBRAI ride each year and has a terrific network of county roads that make it a marvelous place to ride. If your two-wheel travels take you that direction, I'd recommend picking up one of these maps. You can order them from the DOT Iowa Bikes site. Have fun! One day, I found myself biking down an empty little access road next to the notorious 405 freeway during the evening commute. The freeway, as usual, was paralyzed, and I noticed I was actually moving faster than the cars. That's when the revelation hit: Over the past few months, I had discovered a different Los Angeles. There's nothing there that's news to people who read this blog, but it is pretty prominent positioning for articles of this nature. Of course, some of their immediate bite may be muffled by the price of gasoline drifting back down through $2.00 a gallon. With cheaper gas and the onset of cold weather in many parts of the country, it's an easy time to relapse from cycling. I rode to church Sunday. I'm sure nothing could be more fascinating to you than me relating all the times I ride to church. This being All Saints Day, it was a Festival Sunday, and the usual 9:00 Stodgy Service/11:00 Lame Service schedule was changed to 9:00 Quiet Service/11:00 Festival Service. The good news here was that choir didn't need to be there until 10:15 to warm up versus the usual 8:30. With all this extra time there would be plenty of time to ride. I left shortly after 9:00 riding the Atlantis. I build out this frame in June and am only now getting close to 1,000 miles on it. 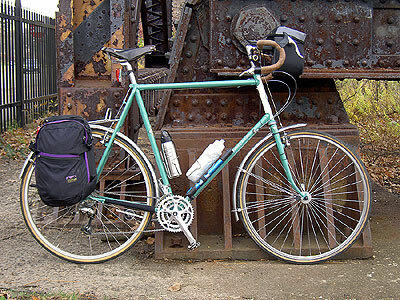 To many cyclists around here, 1,000 miles on a bike is as nothing, you do that by late May. For me, it's as many miles as I've ridden in a season in years. (Actually, I have probably 300 more on the Marin, but it's hard to tell, the computer battery died and my USB drive that I tracked mileage on got wiped out so I lost track). I want to get the bike over 1,000 miles for the season and don't anticipate riding the Atlantis much once the weather turns cold and the streets get salty. It was 36F when I left, and foggy. I've been riding in these conditions in a wool t shirt, a Wooly Warm long-sleeved jersey and an REI DayGlo yellow cycling jacket. I wear a SmartWool skullcap (extremely thin wool, but it helps a lot as I have no hair) under my Bell Metro on which I have not yet installed the Cold Weather Kit with the extremely hilarious-looking basset hound ear covers. I wear some wool pants I got from Marshall Fields and some Pearl Izumi gloves that are not insulated but which work fine for this type of temperature range. Having decided the streets work better than trails at night, I wanted to try my street route in daylight before riding it at night the first time. I made a quick stop at the local Caribou Coffee to get a Mocha in my excellent Jong Won JSB500 stainless steel thermal water bottle, then set off. 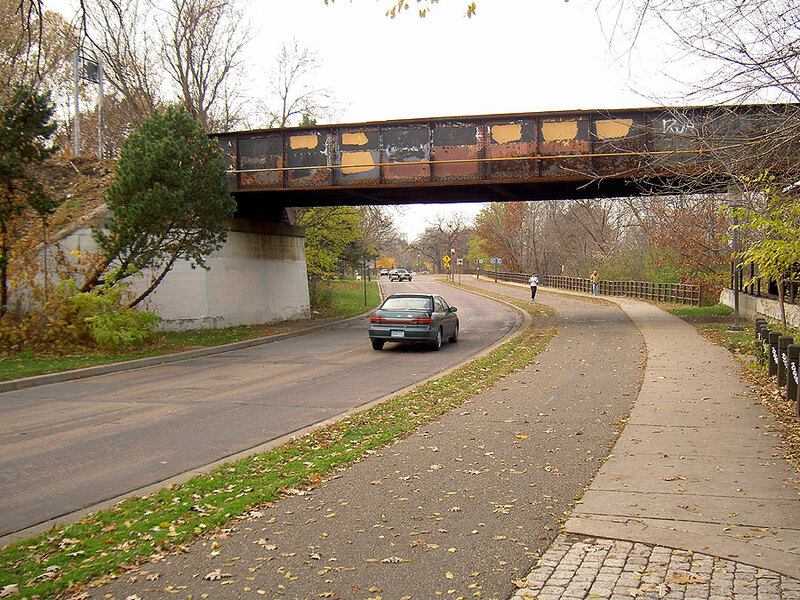 I did my usual Como/Raymond/Pelham/Lake Street Bridge route but rather than taking the West River Road bicycle path I rode a couple of blocks down Lake Street and took 46th Avenue southbound. This is marked as a good bike street on the Twin Cities Bike Map. 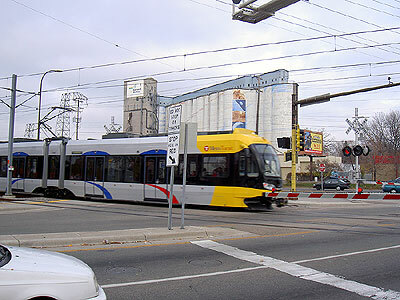 I rode this down to 42nd Street, then headed west across I-35W to Bryant Avenue, then a few blocks south to church. I arrived in 1 hour 3 minutes by my stopwatch including the stop at Caribou. This is a full 10 minutes faster than my usual time when I use the bike paths. It's 12.5 miles even. I like this; it cuts more than a mile from the path-utilizing route and, if less scenic in the daylight, will be shorter and better in the evening. Church over, I saddled up and headed out. I originally thought just to zoom back home, but instead began to get distracted by things on the way home as I looked around. 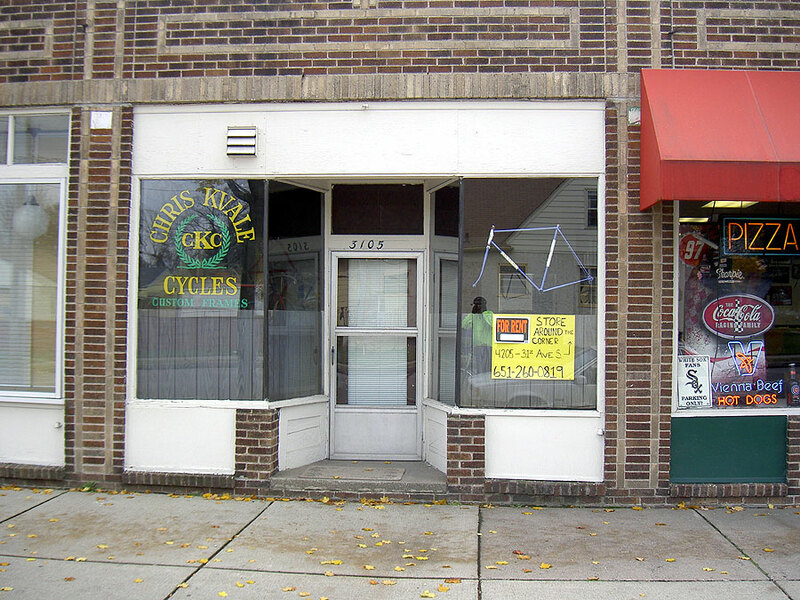 The first was a bicycle framemaker I've never heard of and whose shop I have never seen. This is on 42nd Street just west of Hiawatha. 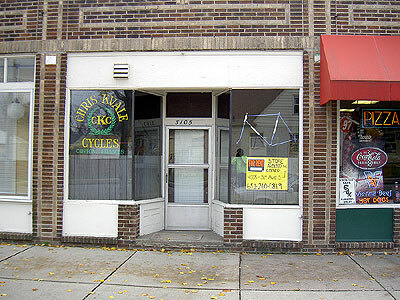 I've never heard of Chris Kvale Cycles before but then I'm not particulary in tune with the Twin Cities cycling scene. I went up and peered through the window. The blue frame hanging there looked very luscious with a beautiful paint job and some superb lug detail work. I think he paints these frames as well. Looking for the link on the web later, it sounds like he's highly regarded. It looks also like he's moving around the corner, the opposite side of the hot dog shop. I rode on a bit. The light rail barriers came clanging down. 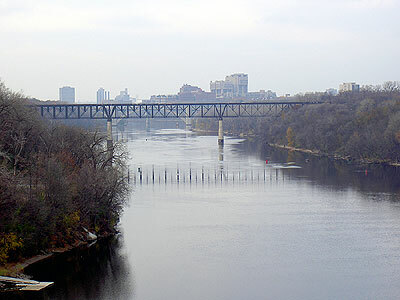 New Minnesota and Old Minnesota. 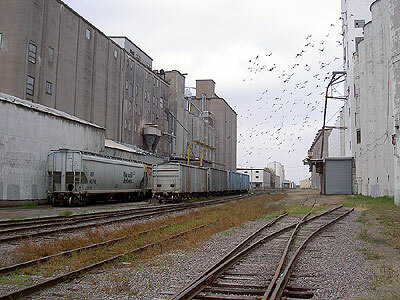 In the foreground, one of the Light Rail trains goes by while in the background, across Hiawatha, stands a grain elevator. Minneapolis was founded on grain milling and trading and a vestige of this business remains scattered along a rail spur on the east side of Hiawatha. 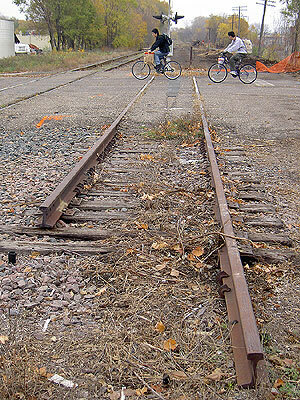 This rail spur has some interesting ramifications for bicycles, too, as you shall see below. 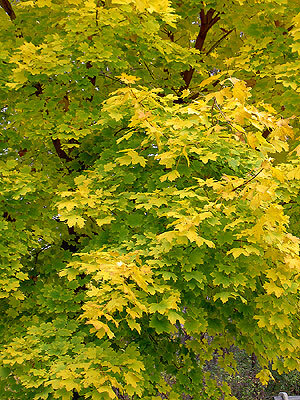 I wasn't in a particular hurry to get home, where lay lots of leaf work to do, and instead meandered up along the streets behind Hiawatha taking some pictures. As with most photos on my blog and website, if you click on the image here you'll get a bigger version. 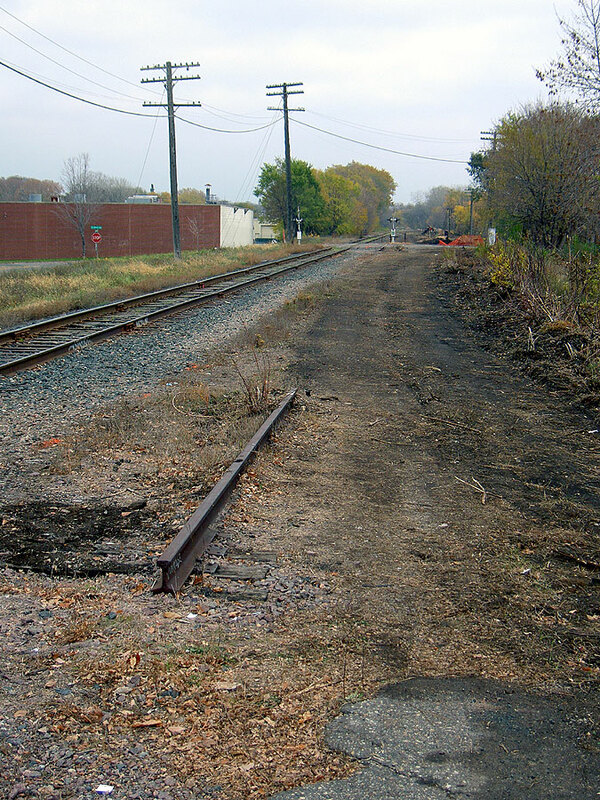 The rail spur along Hiawatha is limited to pretty slow speeds and just sort of peters out so that there is barely a remnant left by the time it gets to Minnehaha. Here, though, it is still active. Here are some grain cars alongside one of the elevatores. For all the financial services businesses and high-tech stuff, this was the core business for Minneapolis for a long time. This house is right behind one of the elevators. I think if I stood between them I could spread out my arms and touch both. I like the wheat mural on this elevator. The train tracks that serve these elevators curve to the east just north of Lake Street and head over to the Mississippi River and Saint Paul. The same rail spur served the train tracks that ran along the Midtown Greenway Bike Trail. There is a plan to put a bike trail alongside the train tracks. I don't know if this means to actually cross the Mississippi or not, but you can see Phase III of the plan here. 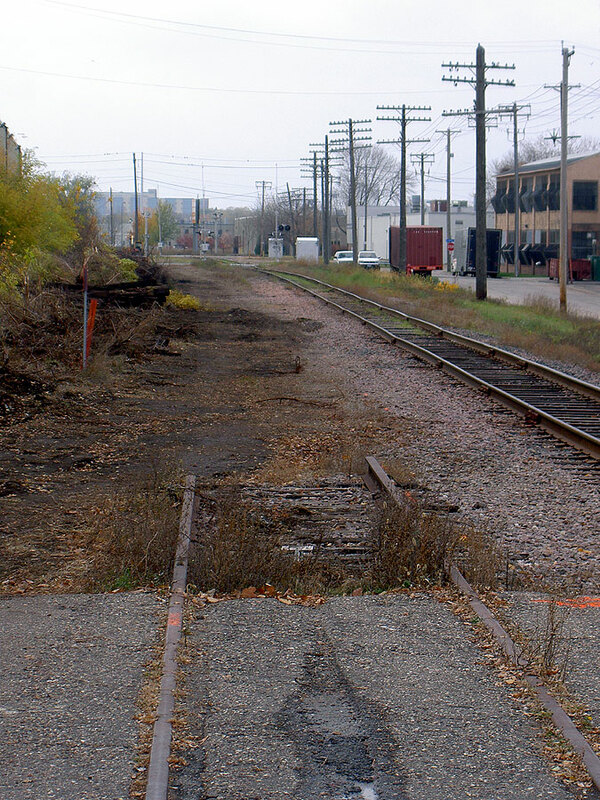 I meandered over to Lake Street and then up to the train tracks. 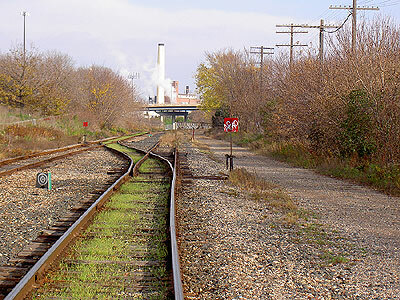 The road crossed on a level crossing. 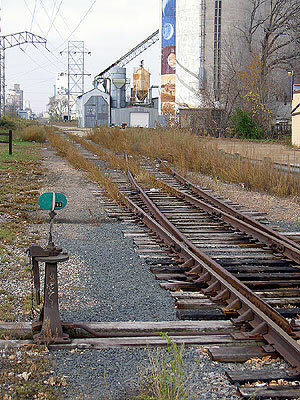 Looking west, you can see the tracks and some of the light industry. Looking east, I noticed that work seems to have started. 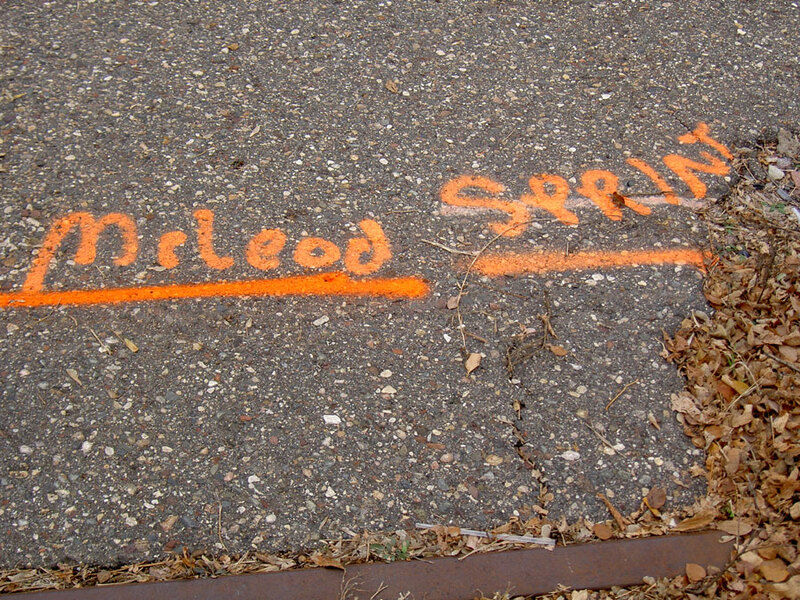 Things were marked up like there was work going on, McLeod and Sprint here. 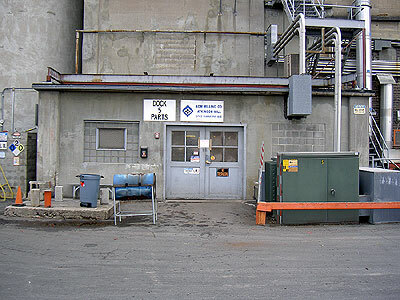 McLeod was once digging down in Eagan and put an auger through both the main and backup data cables for Northwest Airlines, shutting down Northwest's worldwide operations for a few hours. Running main and backup lines right next to each other may help explain why NW is in bankruptcy. 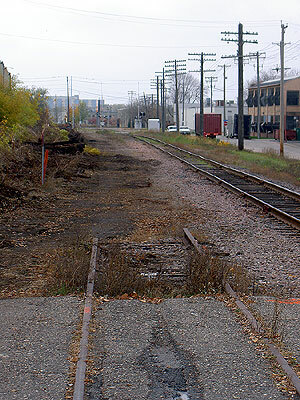 The second set of tracks has mostly been pulled up. The dirt looked pretty hard-packed. The Atlantis is no mountain bike, but the 700C X 28 tires aren't delicate, either, and I decided to ride along and see what I could see. 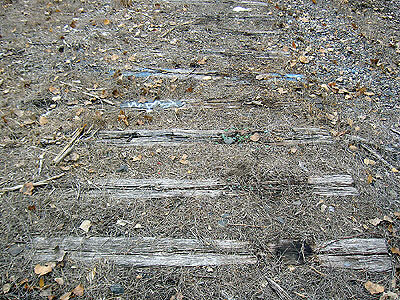 I rode down alongside the tracks. They hadn't pulled up the parallel tracks at the level crossings. Here a couple of Practical Cyclists cross over; the front guy has a grocery bag on his handlebar. 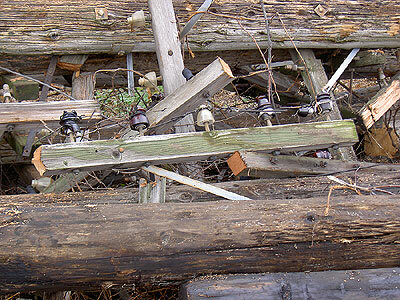 There were heaps of debris. Some of it was trees, some of it telephone poles, some of it railroad ties. 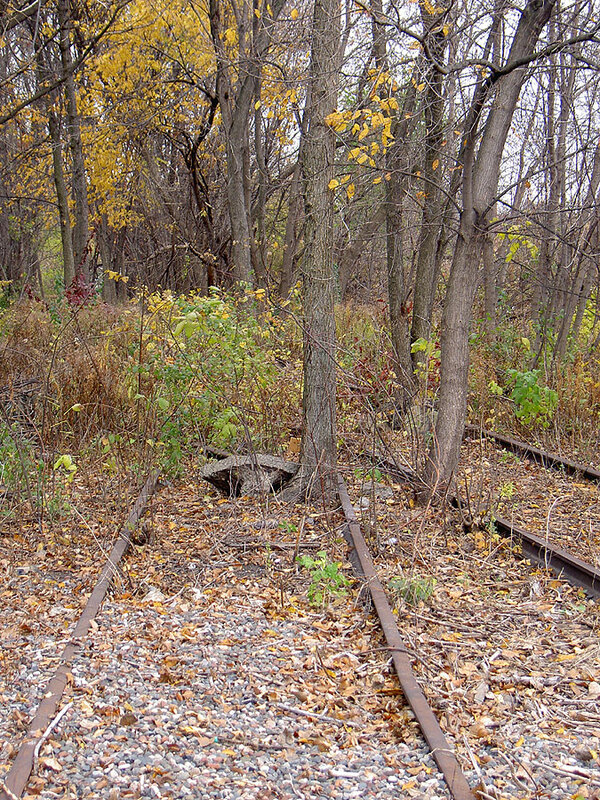 As the tracks move towards the river the land begins to fall away from the railroad tracks which are up on an embankment. 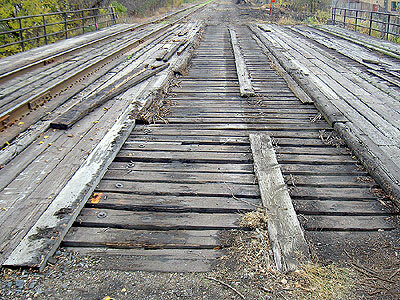 Here a bridge crosses a road where a few blocks west they'd still been level crossings. 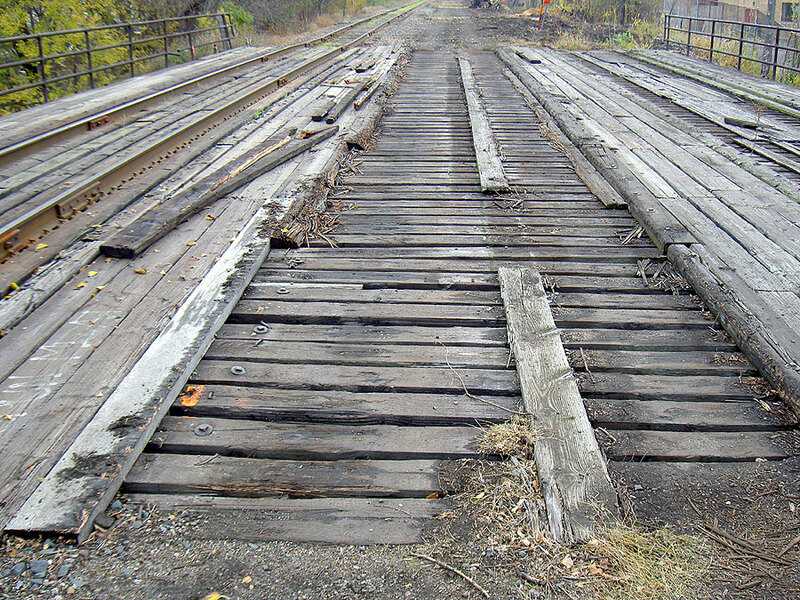 No work has been done on this bridge, but I rode on across. 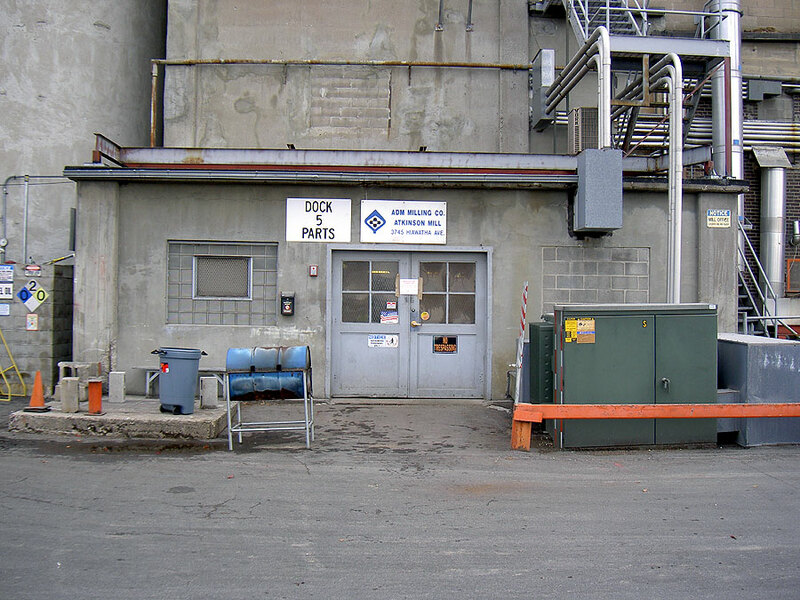 It's mostly light industry along the north side of the tracks. Some segments of the Minneapolis artistic community seem to have found this area already. For all the artistic impression, they could sure use help with their handwriting. 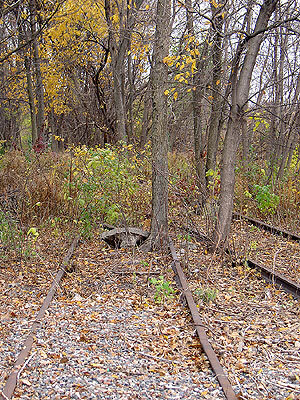 These factories had had rail service at some point, but now the ties in the ground emerged like they were old dinosaur bones. 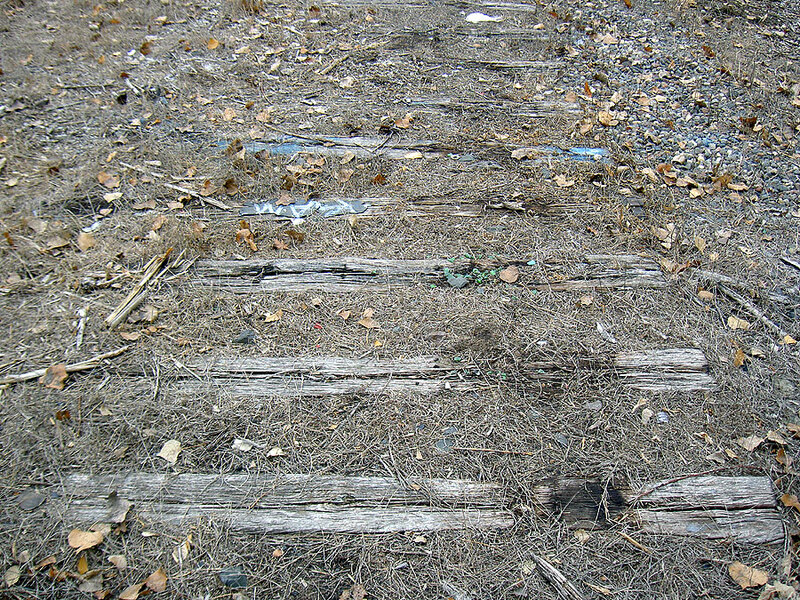 There are some remaining rails, but it's clear they haven't been used in a long time. 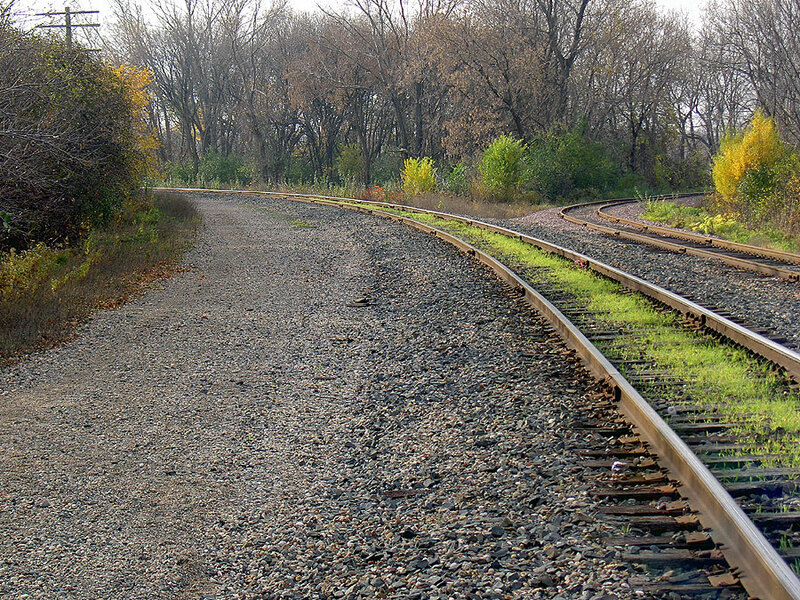 I wonder when the last train ran on these tracks? 1960s? 1950s? 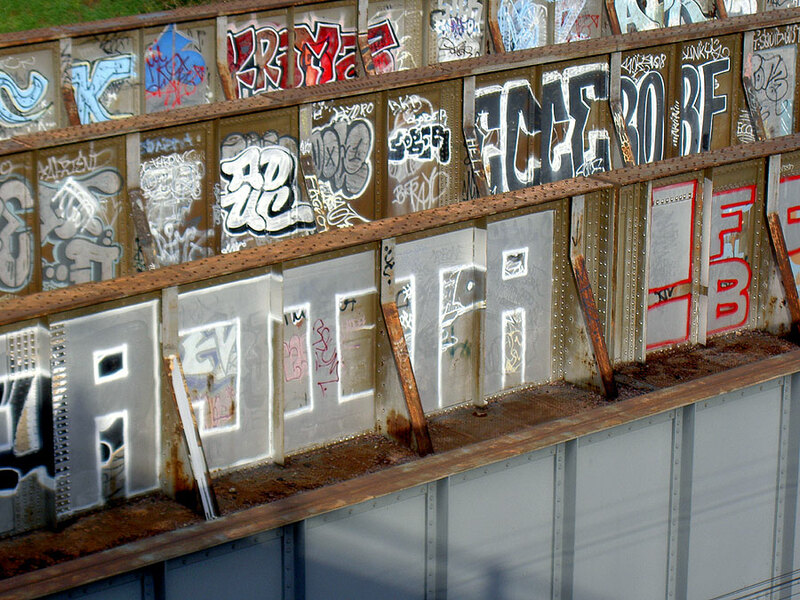 I think some of the graffiti is official. 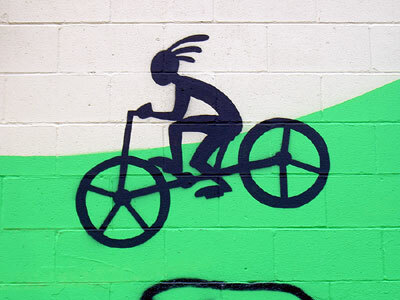 This Anasazi-style cyclist recurs along the factory walls several times, as does a similar runner motif. At 38th Avenue there's a pedestrian tunnel under the tracks. 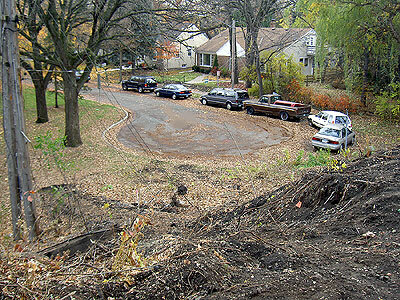 The embankment for the rail line keeps getting higher above the surrounding ground and is quite an obstacle at this point. 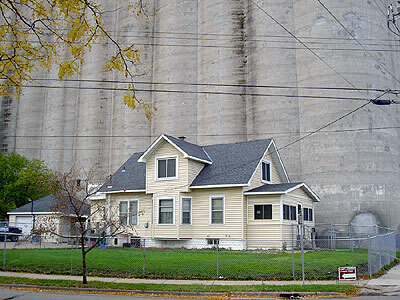 You go by some houses and then come to the west end of the Mississippi River bridge. 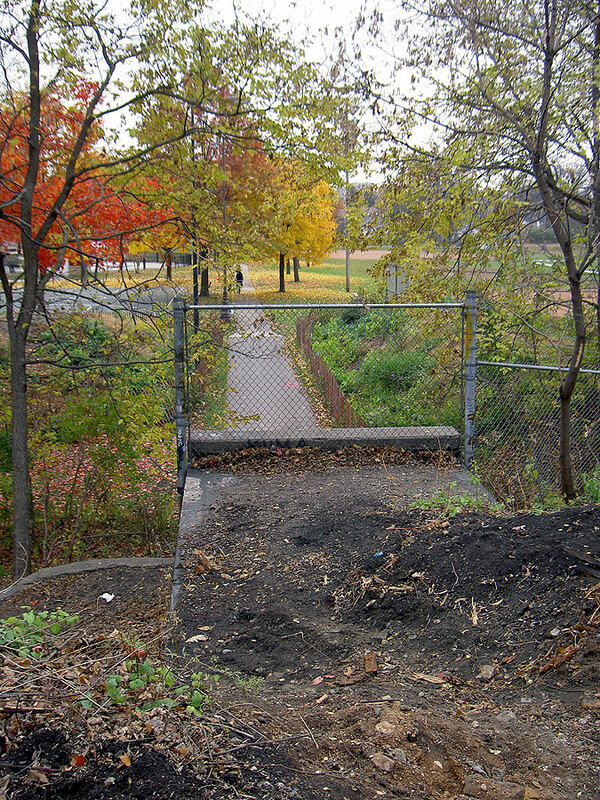 I don't know what the plans are here; it would be great if the trail carried on over the river, and the bridge is wide enough for a single rail track and a path. 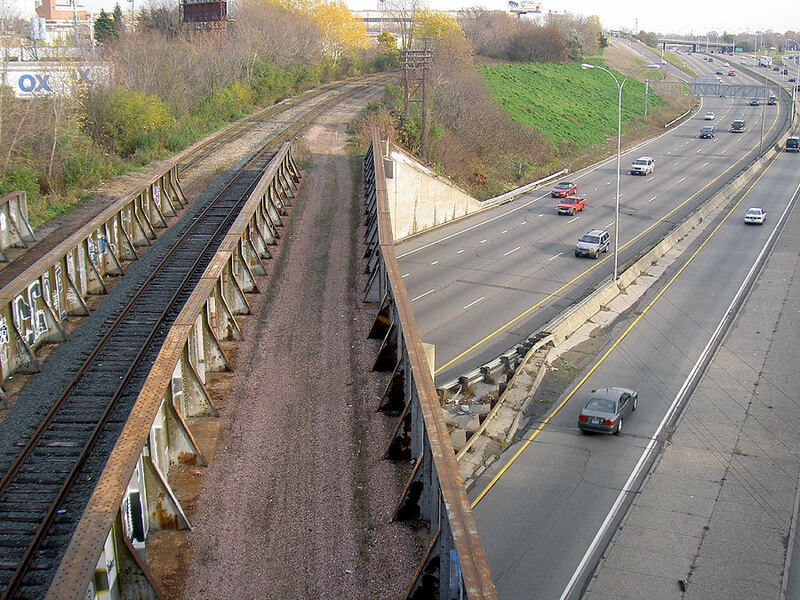 I read on one of the always-useful railfan sites that this is Bridge #22 and was for the former Chicago, Milwaukee, St. Paul and Pacific main line going west. 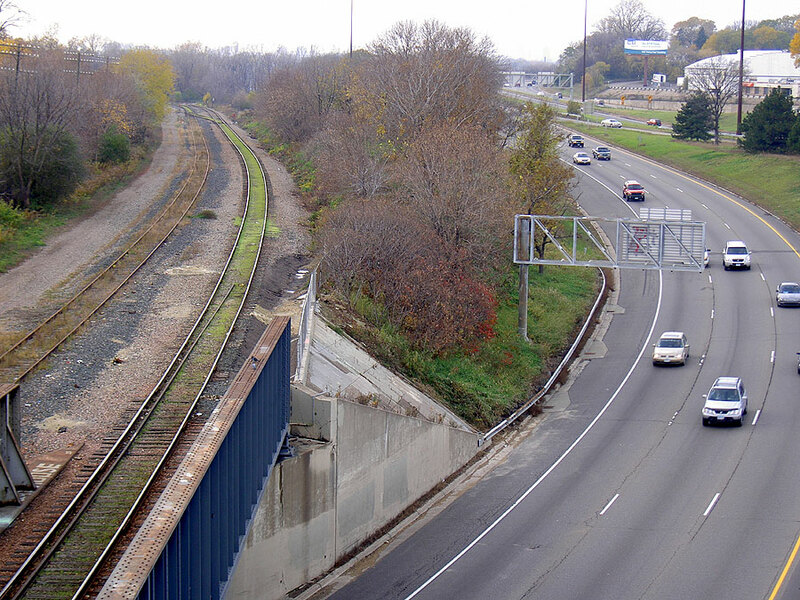 It was called the Short Line Bridge and opened on December 4, 1880. 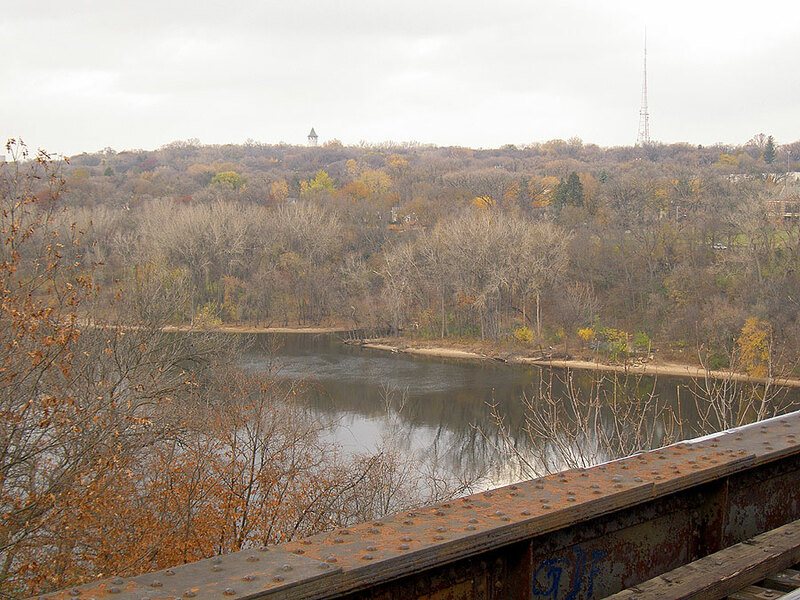 The Milwaukee Road ran passenger trains across the bridge until May 1971 (when Amtrak started). 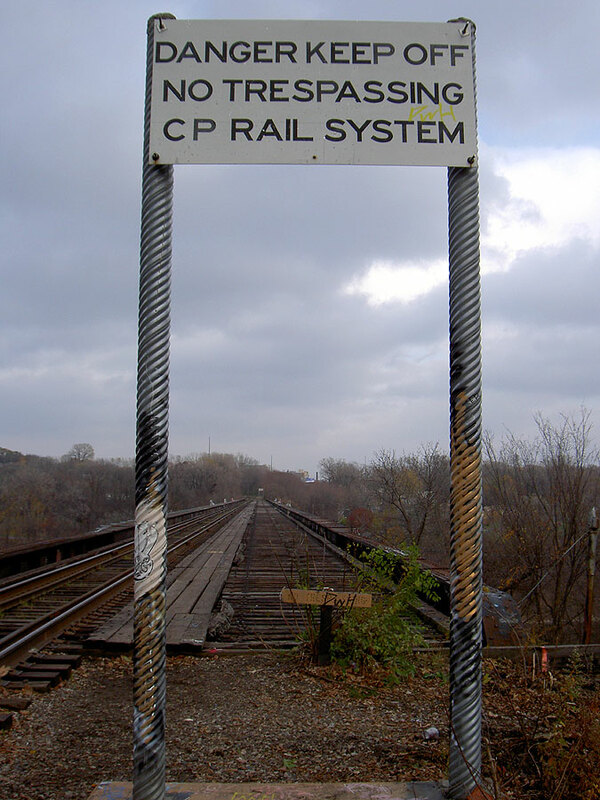 Canadian Pacific and Minnesota Commercial still use the bridge to service the Southtown yard (the stuff along Hiawatha) although it is no longer on a through route and now has only one track. You'd be a long way above the river! I stumbled down the embankment to the West River Road. This is the bridge over the West River Road before it heads across the river. I decided to go over to the Saint Paul side and see where this comes out. I set off down the bike path to the Lake Street Bridge, my usual river crossing, a few blocks south. 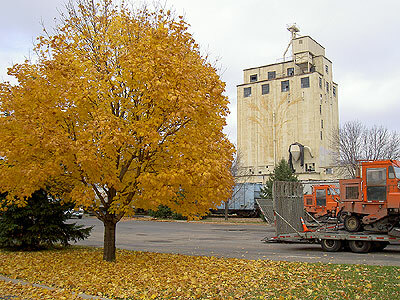 Most of the trees have lost their leaves, but a few are hanging on and haven't even completely turned yet! This is the rail bridge from the Lake Street bridge. This is looking upriver. I rode up the East River Road. The rail bridge is way up in the air here. Heavy Iron. This bridge is built! That's a major nut behind the handlebars. A guy stopped, mistaking me for some other Atlantis rider, and we chatted for a few minutes. I meekly said I was closing in on 1,000 miles; he was getting close to 8,000 for the year, and had just toured in Nova Scotia. He was retired, he said, which gives him lots of time to ride. He noted that the front wheel of the Atlantis had a lot of spokes; it's 36 spokes but is radially-laced, which makes it look like a lot. Funny thing is, the back wheel is 32 spokes. He told me that should be the other way around. He asked if I were riding the same direction, which I thought was nice, but he was going south down the trail and I wanted to go east, so we parted ways. I rode east up Saint Anthony Street which goes from the East River Road to Pelham, a street I've been using on my way to church. I've lived here more than 11 years and had never been on this street. It runs parallel to the tracks and rises quickly up the hill. These are the tracks coming from the bridge. There's room for a bike trail there! And then they go off to the east. I rode up to Pelham. 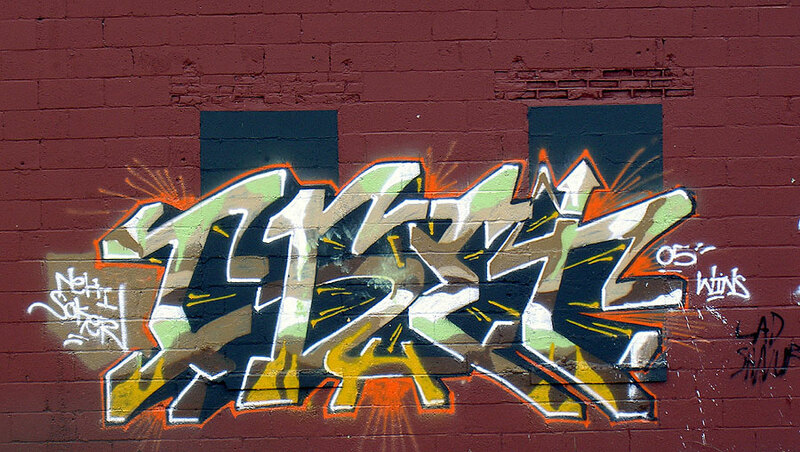 The Saint Paul artistic community hasn't been idle either. A pathway along the tracks would deal very gracefully with crossing the Interstate. This is where Highway 280 goes off to the north from Interstate 94. At this point, teatime was drawing near and I gave up following the tracks and rode on home. Karla, who had been up at 5:30 getting Henry ready for an early Minnesota Boychoir appearance, was feeling fatigued and we had a couple of cuppas. 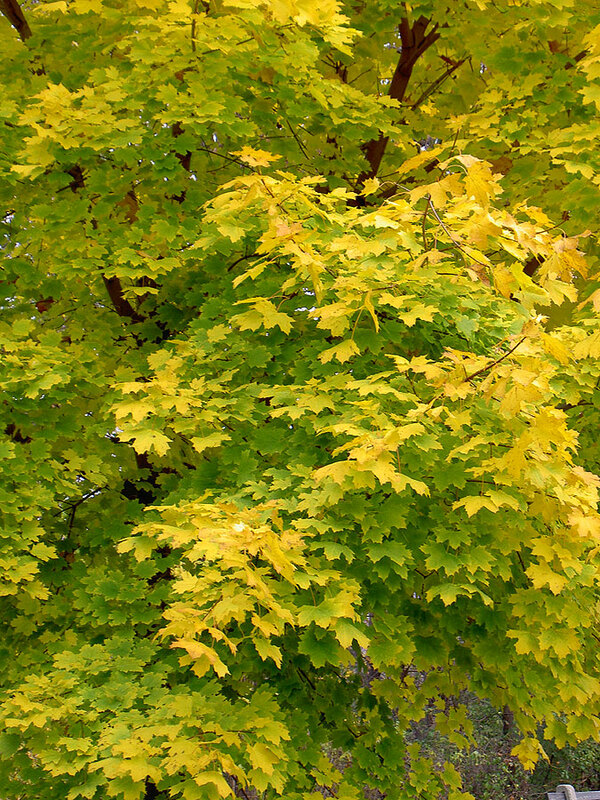 Cycling was done for the day, and Henry and I went out and worked on leaves until dark. Bikes make a great way to explore like this. You can get places that are tough or impossible in a car, everything is accessible, you can see lots, and there's no problem stopping to take some photos, unlike a car, where you've got to park the darn thing every time you want to take a snap. The trail could be pretty cool. If the Greenway actually does extend from the current termination at Hiawatha and continue to the river and then over and into Saint Paul it would be an extraordinarily useful bicycle and pedestrian superhighway. (Actually, you can read about the construction progress here and there are plans to use the rail bridge). The Greenway already joins up very nicely at its western end with other bike paths; to have it connect across the river would be brilliant. I will have to make some inquiries about it. In the meantime, the Atlantis got to 996 miles. One short ride and it'll be over 1,000 for the season. I rode to church choir again. It was 64F outside Wednesday night and the ladies were meeting early, us men weren't due until 7:40, so I figured what the heck, the pumpkin on the back of the Marin isn't rotten yet, let's light 'er up and ride to church. The Marin has big beefy 26" X 1.75" tires on it, all the better for pounding over unseen potholes and obstacles, plus the rear basket and pumpkin were already installed. I headed out right at 6:30. The main difference between this week and last is the end of Daylight Savings Time. It was basically completely dark out as I left, though I wasn't quite as anonymous as I thought; I passed a couple walking a few blocks from home and they called out, where's the skeleton?, a result of my Adventures on Halloween. I went west on Hoyt, through the Fairgrounds, illicitly down the last bit of Intercampus Transitway to Como, and along Raymond to Pelham. I like to think the flickering pumpkin looked good floating along in the darkened State Fair Grounds, for instance, but it's hard to tell when it's behind you. I had a pumpkin malfunction on Pelham and had to stop and find the top and reset it and the bungee cord. I didn't see as many cyclists this time, but the lightless ones could pass by unseen pretty easily. 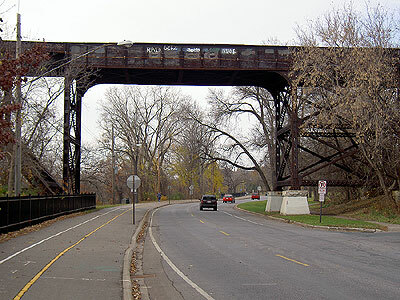 I rode across the Lake Street bridge and down the West River Parkway bike trail. There didn't seem to be as many pedestrians out as last week, either, even though this week was warmer. I did run into some cyclists along the Minnehaha bike path, all showing lights. Of course, in the dark, you can't really see the person, you just get dazzled by the headlight and then they flash by. I was using my Blackburn Quadrant front light. It throws just enough light to be useful in the really dark bits and is probably pretty visible to oncoming traffic. I got behind another commuter for a while. He seemed annoyed that I was behind him. He'd speed way up and slow down while I plugged along behind. He wasn't so slow that I felt compelled to overtake him nor so fast that I wouldn't catch back up. He finally took off in a standing sprint and got a long way ahead of me and made a green light where I caught the red, and I didn't see him again. He had a helmet light on but it was pretty dim. He also had a taillight, but it was hidden by a bag strapped to his rack so that it wasn't visible until you were almost on top of him. Not like my pumpkin, with five LED blinkies all blazing away inside it. I think it's stupid not to show lights when riding at light. I got to church right about 7:45. I've done the ride in 1:05 (on the Atlantis, in daylight) but 1:15 seems more realistic, allowing for lights, pumpkin malfunctions, etc. The one trouble is, choir-wise, my throat gets dried out and the tone of my voice isn't as good as it should be. We're just rehearsing, it's Sunday mornings that count, but I may need to come up with a good warming-up drink to help me when I ride there, not that that will happen much more this season. Going home, I rode 46th and then 42nd Streets, then north mostly on 46th Avenue. I think the streets are actually better than the trails in the dark. At least cars all have lights, the street lighting is brighter, you don't have the picturesque meanderings along the creek which all of a sudden are dark, ill-lit turns concealing dog-walking pedestrians, oncoming lightless bikes, etc. If you do see other bikes (and I saw a couple of others), you aren't confined to a narrow pathway. I think in the dark, I prefer the streets. Once home I took all five blinkies out of the pumpkin and removed it from my basket lest it rot in position. Garbage ain't 'til Tuesday. I don't know what people thought of it, whether it provided moments of confusion or annoyance or happy delight. Often you don't know how you affect others, and hope only that on the whole it's positive. I like the whimsy of the pumpkin taillight and will undoubtedly do it again next year. Halloween this year gave a sudden lurching realization that my children are getting big. 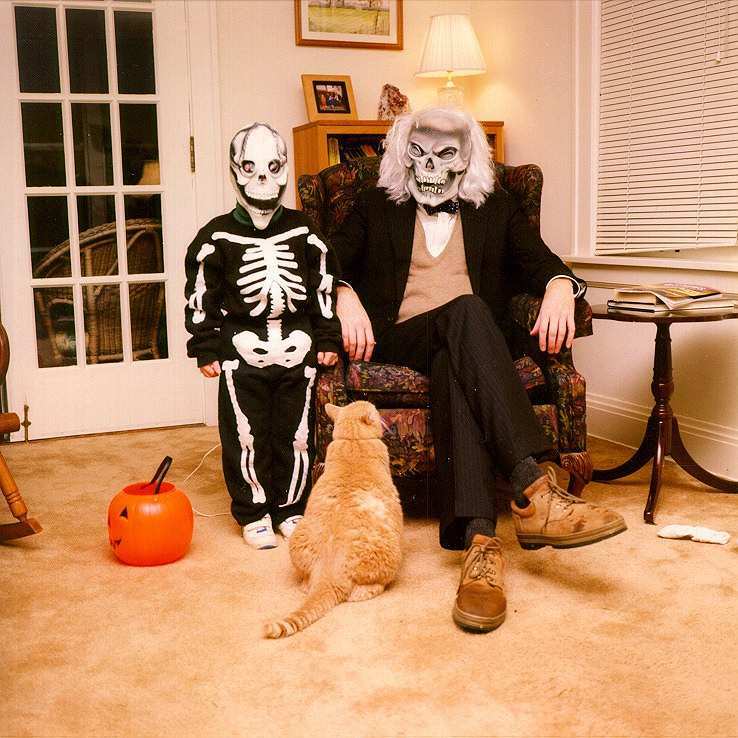 As a kid, I did the usual Halloween stuff, costumes and trick or treating (and, for my Des Moines years, the oddball Beggar's Night). Once I was through college and in an apartment and then in a house, I delighted in giving away full-sized candy bars rather than the snack size. Once we had children, I began to take them out for Halloween in a succession of cute costumes. Henry in particular would put forth unflagging effort in collecting free candy as we'd range far and wide through the neighborhood. Last year Geneva for the first time kept up with him through the whole evening and they each collected ten pounds of candy (we weigh it each year). 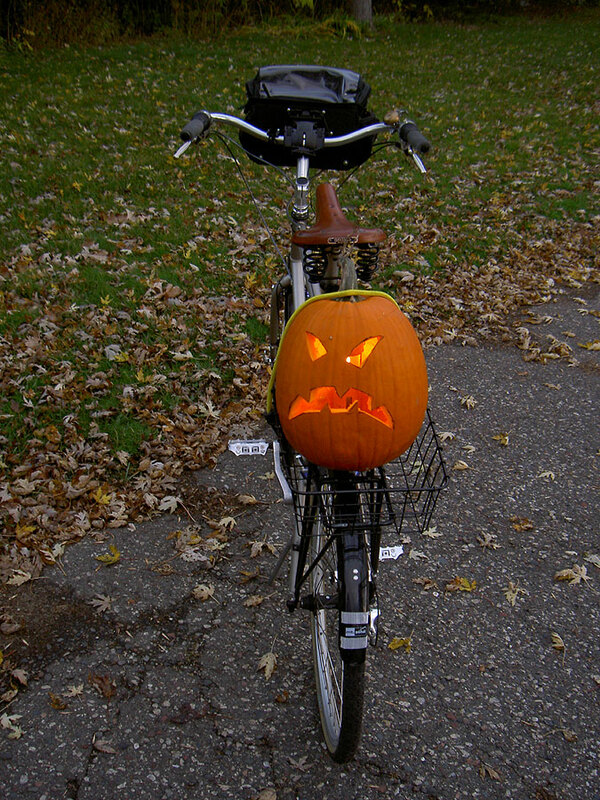 Last year, while I strolled along, there was someone on a bicycle who rode by a few times in a strange costume with an enormous head that looked like it was made of paper mache. They didn't say anything, they just rode past and waved, up and down the streets of the neighbourhood. This year, Henry still wanted to go trick or treating but Geneva didn't. She wanted to hand out candy and see all the cute kids in their costumes. 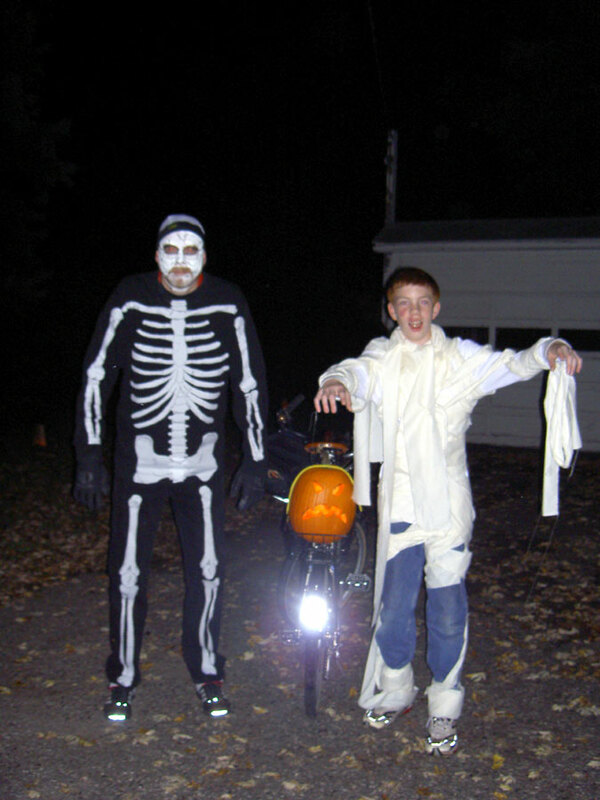 I thought back to the guy on the bicycle and to a classic skeleton costume we'd made for Henry ten years ago and thought, that'd be fun. 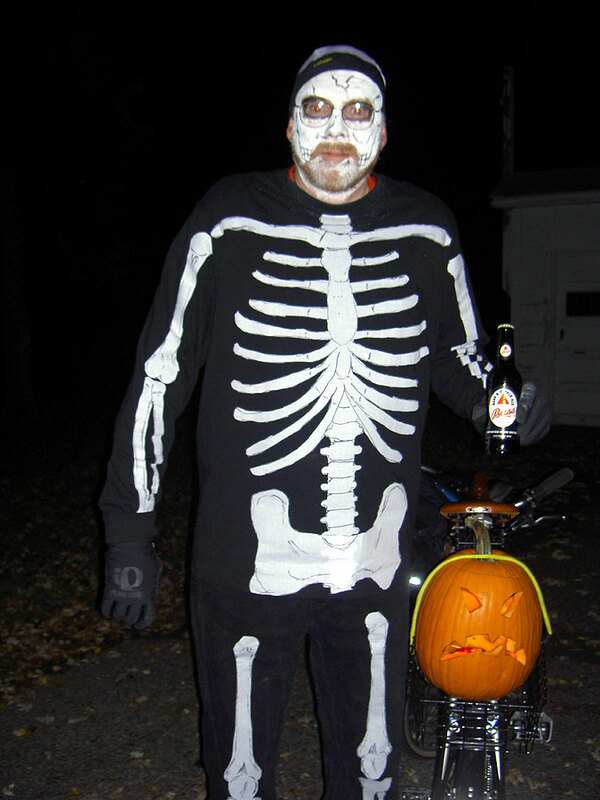 I could make a skeleton costume, ride my bike up and down the streets, put a pumpkin on the rear rack and give out candy! So, I made a costume. The top is a cheap XXL black long-sleeve t-shirt from Target, the bottom a pair of old black Levi's. I cut out bones from fusion interfacing and ironed them onto the garments. 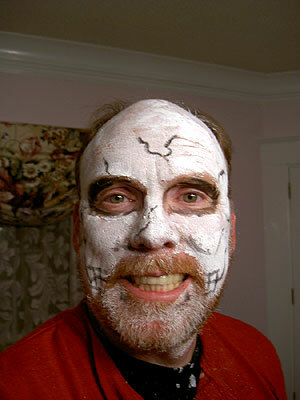 I also bought white and black face paint to make my head look like a skull. Finally, I have a white helmet liner made for use in the summer to reflect sun and wick sweat; that would serve to keep my head warm. Some thin black gloves would keep my hands warm. Karla had bought five pumpkins. 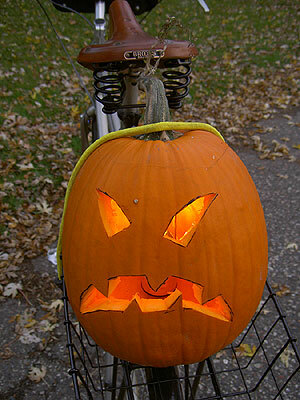 I carved a couple, including one about the right size for the bicycle basket. This Wald basket is one we have lying around which I zip-tied to the rear rack of my Marin Pine Mountain Urban Assault Bike. 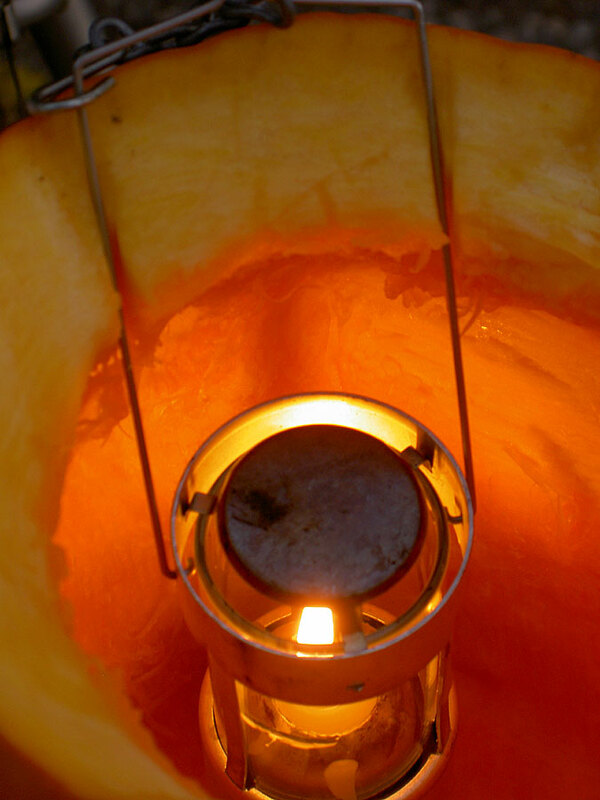 I initially set up the pumpkin with an REI candle lantern, for a couple of decades my preferred source of light when camping. Here's the pumpkin mounted and ready to go. This is my Marin Pine Mountain, not the Atlantis. This bike has fat 26" street tires on it, all the better for pounding over obstacles I can't see in the dark. 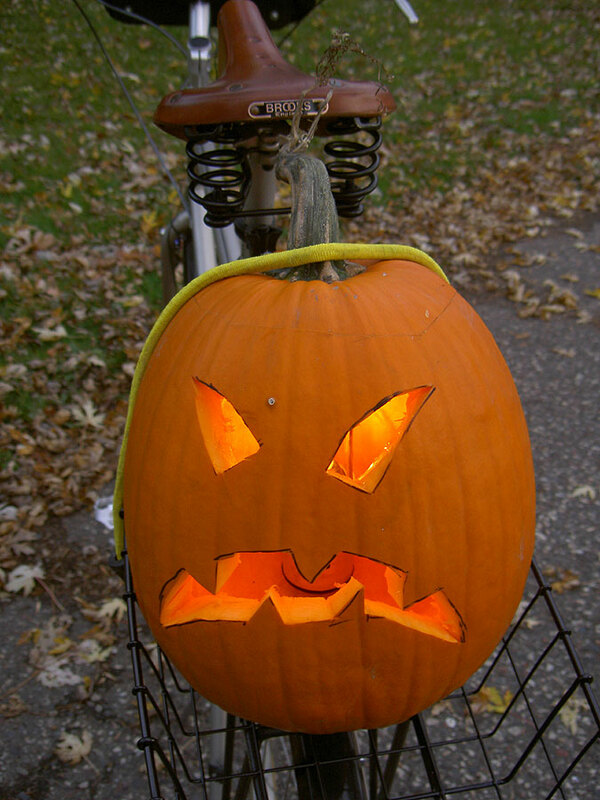 The basket is zip-tied to the rear rack, the pumpkin wedged in place against the front of the basket, and a yellow bungee cord holds the pumpkin down and the lid on. Here's a closer shot of the pumpkin. The light to start with was from an REI candle lantern. I cut a couple of slots in the pumpking and the lid held the wire bail in place. I had high hopes for this arrangement. About 6:30 we set out, Henry wrapped in yards of muslin as a Mummy, me in my skeleton outfit with white skull-head and pumpkin. 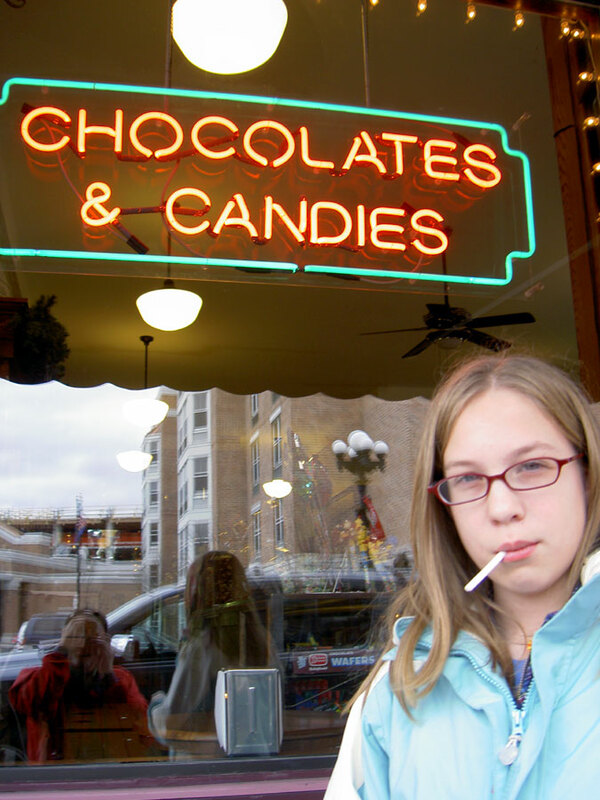 Hello, little girl, like some candy? This is my skull makeup at the end of the evening. My beard kept me from getting the whole jaw really white. Still, at a distance, the effect was good. I soon ran into technical difficulties with the pumpkin. The candle kept going out. These candle lanterns work great even in pretty wet and windy conditions when camping, but something about the bike was giving the candle trouble. I wonder if it was sloshing wax from stops, starts, bumps and turns, something it doesn't have to deal with when camping. I'd stop and re-light the candle lantern but kept having to check over my shoulder to see if it was still lit. After a while I rode home, took out the candle lantern and instead put in four LED blinkie taillights all set to steady on. This worked great. The light bounced and reflected around the interior of the pumpkin and gave a good strong orange-red glow out the carved face. (Later, when the evening was done, I tried putting all four lights on blink, and that was even better; they all blink at different rates, giving this flickering effect). Thus equipped, I rode around. I startled a number of people. I think I startled a lot of drivers. Clad in black, I was unwilling to ride in front of people who had a Stop sign, worried they'd coast on through and hit me, so I'd so a right turn. The poor driver would be coming up to an intersection when suddenly this enormous skeleton on a bike would come looming around the corner. A couple of adults I talked to (during brief pumpkin maintenance stops, or when stopped to give children candy) said the effect was very startling. I would have liked to see what the pumpkin was like from a distance, since it would roll down the street, around corners, and probably looked pretty odd in dark areas since I was showing no rear lights at all. Halloween's a great night to ride around. Part of the fun is how open and lit up people's houses are; you can see in, check out the neighborhood. It was fun when I'd walk with the children to note who was nice and who was grouchy, to see people come and go, who was cheap and who generous, even who was really stingy, like the year one guy gave out poems. I didn't shadow Henry this year, instead ranging far and wide through the Como neighborhood and even riding around the Como Lake. I was hoping I'd see the big-headed cyclist from last year and rode some of the same streets but there was no sign of that person. This was too bad, I'd like to have heard how they came up with the idea. I got one treat; waiting at a corner, a guy came out who'd seen me ride by and said, you're working hard tonight, here's a treat and handed me a bottle of Bass Ale. Hot damn! Beer trick or treatin'! It was unopened and I kept it until the night was done. Here's Henry and I at the end of major candy operations. The strips of reflective tape on my read fender sure work well in this photo! Henry's mummy costume was getting pretty ragged. At one point I'd ridden by him and a dog had come out of a house and was tugging on a loose piece of wrapping. Despite his costume malfunctions and attacks by vicious canines, he collected 12 pounds of candy, a really good outing. My costume was inspired by one we did for Henry ten years ago. Here we are then. Here I am with my bottle of Bass. Next year I think I'll do hand bones as well, so the arms don't just end at the gloves. In this picture, lit with the camera's flash, you don't get to appreciate the lurid red glow of the blinkies in the pumpkin. I had my first SPD crash. I'd felt pretty smug about going clipless this summer with my SPD pedals on the Atlantis and the Marin and never having the inevitable crash new SPDers are supposed to encounter. Since getting the Atlantis, my miles on the Marin have been pretty limited. The pedals on the Marin, some Nashbar-brand SPD on one side, platform on the other, have a lot tighter releases than the Ritcheys on the Atlantis. So, I come up to an intersection where there is some traffic confusion and slowed way down and then stopped and my foot wouldn't release and over I went. As I fell, I'm thinking, great, I haven't crashed in years, and here I go on one of the few times I'm not wearing a helmet. Crash! Predictably, as soon as I hit, my shoe released. I scraped my knee and banged my elbow but other than that my main injury was to my dignity. Fortunately, in skeleton costume nobody knows who I am! Crash? What crash? Riding like this is not for the faint of heart. I usually try to be very visible and now I was riding around in black with no front lights on a night full of oblivious pedestrians and distracted drivers. On the other hand, I was generally meandering at a stately pace, not pushing to make time, and so could pay lots of attention to being cautious, avoiding drivers, etc. I'm thinking next year I might do it again but cruise around more of the city, not just up and down the streets of our area. It would be kind of fun to go up and down Summit, ride around Crocus Hill, maybe even pop down to Concord or Lake Street where the skeleton motif would fit right in with the Dia de los Muertos theme. Skeleton-costumed cyclists riding around with pumpkin taillights giving out full-sized candy bars to little children has to win us some goodwill, right? Plus, it's fun. It could be the start of a trend!